Cassava is the star ingredient here. It brings its own flavour and adds a delicate crunch. These can be enjoyed on their own, or served with fresh fruit and a little mascarpone. Cassava can be found in African – Caribbean and Asian shops and in the frozen section of some supermarkets. Mix the flour, cassava, sugar, baking powder, and salt in a bowl. Add the butter and using your finger tips combine until the mixture resembles coarse crumbs, similar to a scone mix. Add just enough milk (you may not need it all) and gently mix until the dough comes together. The less you work it the better. Chill for at least 30 minutes. Place on a floured surface and using your hands, gently flatten to about 2cm/1 inch thick. Cut into biscuit-size rounds. Place on a baking tray, brush the tops with beaten egg yolk and sprinkle with gari. Bake in the oven for 12 to 15 minutes until golden brown, remove from the oven and cool on a rack. Place the fruits in a bowl and toss. 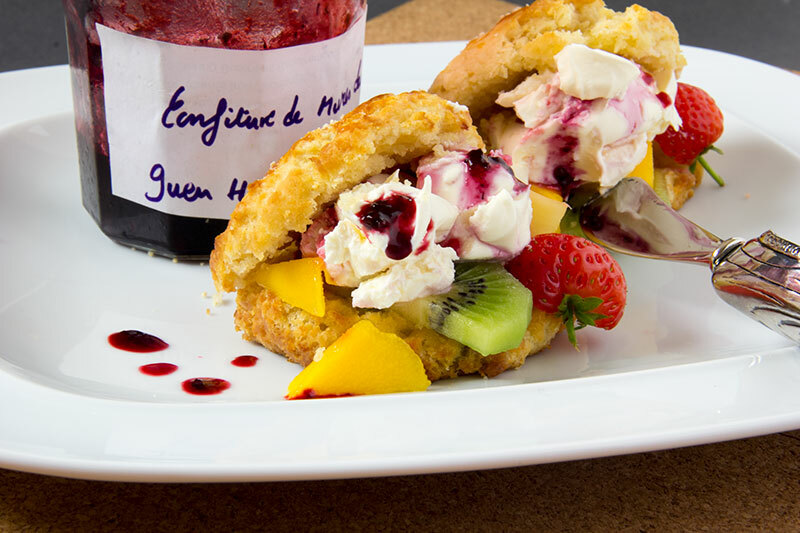 Slice a scone in half, heap fruit over the bottom half, swirl the mascarpone cheese with berries and spoon onto the scone. Rest the top half against it and dust with icing sugar. No Replies to "Cassava Scones"